Lots of new titles from Osprey! Prolific military publisher Osprey recently has released a number of new titles for the World War II buff. Many of these are of utility to the WWII miniature wargamer. The good blokes at Osprey Publishing in merry ole’ England have been quite prolific in recent days with new volumes within their already impressive line-up of books of interest to military history buffs and wargamers. Among the recent new releases is Volume #160 of their Elite series. 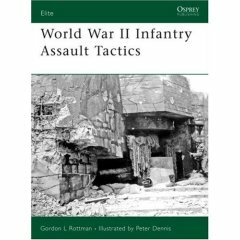 Entitled World War II Infantry Assault Tactics, this 64-page softback book is a very worthy addition. While so many books focus on the equipment, organization, uniforms, and battles, this one is a departure, focusing on ground assault tactics on a micro-level. The author, Gordon L. Rottman, is a former infantryman well versed in the art of small arms combat, and his experience and research, coupled with his strong prose, enable the reader to get a good grasp of small unit tactics during the Second World War. 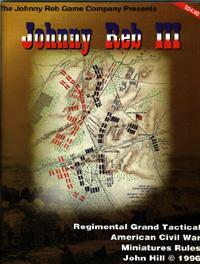 A reader sent in some excellent observations and thoughts regarding the Johnny Reb 3 American Revolution variant rules. I thought I would share them, as they are of interest to gamers wishing to recreate this period. One of the trends in tradebook publishing in the past two decades has been the strong growth of historical fiction, particularly those books aimed at women. Combining plots that strongly emphasis character development and personal interrelationships with believable historical situations and settings, these books generally sell very well and appeal to a broad audience. Some, like Cold Mountain, have become best sellers that have cut across across wide genre of readers. The most recent addition to this segment of the book industry comes from a Gettysburg author, Jessica James. 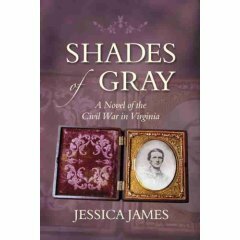 Shades of Gray: A Novel of the Civil War in Virginia (ISBN 978-0-9796000-0-5, softback, 524 pages) is a worthy addition to the line up. Published by Patriot Press, the novel concerns the growing relationship between a Virginian who is a ardent secessionist and Confederate advocate. The lead female character, by contrast, is a devoted Unionist. The interplay of their divergent beliefs, coupled with the backdrop of the growing war, is well written and sustaining. Crisp, well flowing, and with a storyline that holds your attention, James shows off her talents as a novelist, as well as revealing a solid understanding of the Civil War era. Randy Drais has created an interesting new general overview / website of the Battle of Gettysburg entitled, appropriately enough, Battle of Gettysburg Buff. A life-long resident of York, Pennsylvania (the county immediately east of Gettysburg’s Adams County), Drais’s ancestor was wounded while serving in the 12th U.S. Infantry on the second day of the battle. Researching his ancestor inspired Randy to create this wide-ranging website, which offers a diverse array of general information on the battle, battlefield, town, and surrounding area. Give it a long look! The Battle of Roanoke (or Fort Huger) was fought in Dare County, North Carolina, on February 7 and 8, 1862 as part of Ambrose Burnside’s North Carolina Expedition. Burnside led some 7,500 Federals against Brig. Gen. Henry A. Wise’s 3,000 Rebels. By sundown on the 8th, 50 men were dead, 276 wounded, and 75 missing between the two forces. Nearly 2,500 Confederates were now prisoners-of-war, and the island was in Union hands. A few years ago, I created a step-by-step series of charts for newcomers to Johnny Reb 3 (with the written permission of author John Hill). I developed them originally when I lived in the greater Cleveland area for my teenaged sons and their church and school buddies to help introduce them to the rules set. I posted these some time ago on the Yahoo Groups message board for JR3 gamers, and I thought I would post them here for the broader community. Try them out as you play JR3 with newcomers, and let me know what you think!!! Several readers have asked me to post the variant charts for the home-grown American Revolution version of the popular Johnny Reb 3 rules set. Author John Hill gave permission to Minnesota gamer Lee Barnes to develop a variant for AWI gaming using the JR basing system, and I slightly tweaked Lee’s charts (first published in The Zouave) and changed the format slightly, as well as adding some material from my own AWI version.